Organized at Altoona June 30, 1863. Mustered out August 9, 1863. Organized at Harrisburg June 19, 1863. Mustered out August 1, 1863. Organized at Harrisburg June 17, 1863. Mustered out July 30, 1863. Organized at Pittsburg July 9, 1863. Mustered out October 5, 1863. Organized at Philadelphia July 2, 1863. Mustered out September 16, 1863. Organized at Lancaster July 19, 1864. Mustered out October 29, 1864. Organized at Harrisburg June 21, 1863. Mustered out August 12, 1863. Organized at Wheeling, W. Va., November 6, 1862. Attached to Railroad District, 8th Corps, Middle Dept., to March, 1863. 4th Brigade, 1st Division, 8th Corps, to June, 1863. Campbell's Brigade, Scammon's Division, West Virginia, to December, 1863. 2nd Brigade, 2nd Division, West Virginia, to February, 1864. SERVICE.--Scout and guard duty in Railroad District, Middle Dept., and on Upper Potomac until February, 1864. Action near Moorefield, W. Va., April 6, 1863. Williamsport, Md., August 4. Burlington October 13. Descent upon Salem December 16. Jackson River, near Covington, December 19. Operations in Hampshire and Hardy Counties December 31, 1863-January 5, 1864. Medley January 29-30. Evacuation of Petersburg January 30. Burlington February 1. Consolidated with Ringgold Battalion February 9, 1864. Organized at Harrisburg August 12, 1864. Mustered out November 25, 1864. Organized at Allegheny City August 19, 1861. Attached to 1st Virginia Union Cavalry and transferred to 1st Maryland Cavalry as Company "L" January, 1862. Organized at Harrisburg June 18, 1863. Mustered out August 11, 1863. Organized at Harrisburg June 20, 1863. Mustered out July 31, 1863. Organized at Philadelphia January 21, 1862. Mustered out January 26, 1862. Tendered services to the Government April 15, 1861. Not at first accepted, but finally mustered in May 13,1861. Moved to Carlisle, Pa., May 29-30. Attached to Geo. H. Thomas' Command. Moved to Chambersburg May 31, and to Greencastle June 7. To Williamsport June 12. Advance to Falling Waters June 17. Action at Falling Waters July 2. Bunker Hill July 2. Occupation of Martinsburg July 3. 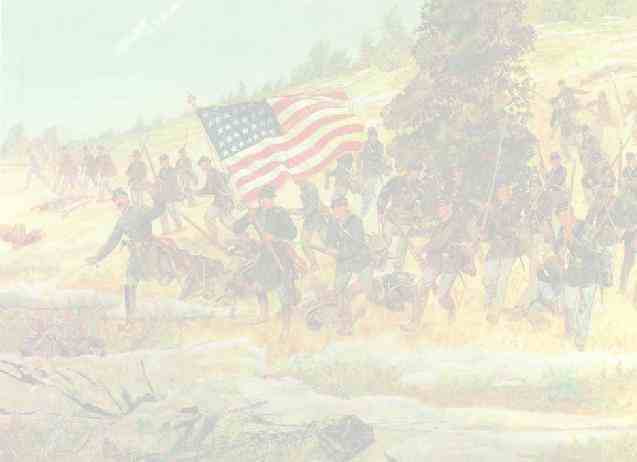 Advance to Bunker Hill July 6. Bunker Hill July 15. Occupation of Charlestown July 17. Moved to Harper's Ferry July 21. To Sandy Hook August 3. Guard Kelly's and Antietam Fords and Charlestown Road. Mustered out August 17, 1861. Again tendered services May, 1862, and August, 1862. Not accepted. Tendered services June 16, 1863. Accepted June 18. Moved to Gettysburg, Pa., to observe enemy. Driven from South Mountain and Gettysburg June 26, and from York to Wrightsville June 27. Retreat to Columbia and duty there until July 4. Moved to Harrisburg. Relieved from duty July 31, 1863. Organized at Reading July 30, 1861. Transferred to 1st Pennsylvania Cavalry as Company "L" November, 1861. This battalion, composed of five companies, was organized at Washington, Pa., from June 19, 1861 to October 14, 1862, to serve three years. It was consolidated with the Washington and Lafayette Cavalries, February 9, 1864, to form a battalion, which was consolidated with the 2d Pennsylvania Cavalry February 22, 1864. Organized at Washington, Pa., June 29, 1861. Ordered to West Virginia and attached to Army of Occupation, West Virginia, July to October, 1861. Cheat Mountain District to January, 1862. Lander's Division to March, 1862. Hatch's Cavalry Command, Banks' 5th Corps, to April, 1862. Railroad District, Mountain Dept., to July, 1862. Railroad District, 8th Corps, Middle Dept., to September, 1862. SERVICE.--Campaign in West Virginia July 6-17. Rich Mountain July 11. Carrick's Ford July 13-14. Burlington September 2. Operations on Cheat Mountain September 11-17. Petersburg September 12. Romney, Hanging Rock, September 23. Romney September 23-25. Mill Creek Mills, Romney, October 26. Near Romney November 13. At Romney until January, 1862. Expedition to Blue's Gap January 6-7. Hanging Rock Pass January 7. Bloomery Furnace February 14. Advance on Winchester March 7-15. Strasburg March 18. Kernstown March 22. Battle of Winchester March 23. Columbia Furnace April 15. Two Churches and Rood's Hill April 17. Duty in Railroad District, West Virginia, until September. North River Mills August 15. Huttonsville August 18. Transferred to Ringgold Battalion September, 1862. Organized at Harrisburg July 15, 1864. Mustered out October 29, 1864. Railroad troops. Organized at Philadelphia July 15, 1864. Mustered out October 31, 1864. Organized at Allegheny City April 5, 1861. Entered 1st Virginia Union Cavalry and transferred to 1st Maryland Cavalry as Company "G" January, 1862. Organized at Harrisburg August 17, 1864. Mustered out November 30, 1864. This regiment was organized at Wheeling, West Va., August 19, 1861, to serve three years. It was consolidated with the Ringgold Battery and Lafayette Cavalry, (Pennsylvania vols.) and transferred to the 22d Pa. cavalry, February 24, 1864. Organized at Wheeling, W. Va., August 19, 1861. Attached to Army of Occupation, West Virginia, to November, 1861. Railroad District, Mountain Dept., West Virginia, to January, 1862. Lander's Division, West Virginia, to March, 1862. Hatch's Cavalry Command, Banks' 5th Corps, to April, 1862. Railroad District, Mountain Dept.. to July, 1862. Railroad District, 8th Corps, Middle Dept., to January, 1863. Romney, Defenses Upper Potomac, 8th Corps, to March, 1863. 4th Brigade, 1st Division, 8th Corps, to June, 1863. Campbell's Brigade, Scammon's Division, Dept. West Virginia, to December, 1863. 2nd Brigade, 2nd Division, Dept. West Virginia, to February, 1864. SERVICE.---Greenbrier River October 3-4, 1861. Expedition to Blue's Gap January 6-7, 1862. Hanging Rock Pass, Blue's Gap, January 7. Advance on Winchester March 7-15. Strasburg March 18. Battle of Winchester March 23. Columbia Furnace April 16. Two Churches and Rood's Hill April 17. Guard and scout duty in Railroad District of West Virginia and Defenses of the Upper Potomac until February, 1864. Actions at North River Mills August 15, 1862. Wire Bridge August 16. Moorefield August 23. Glenville September 30. South Branch Potomac, Moorefield, November 9. Romney December 1. Green Springs Run March 7, 1863. Williamsport, Md., July 8. Fairview July 9. Hedgesville and Martinsburg July 18-19. Whitehall July 22. Burlington August 4. Descent upon Salem December 16. Jackson River, near Covington, December 19. Petersburg January 10, 1864. Operations in Hampshire and Hardy Counties January 27-February 7. Moorefield February 4. Consolidated with Ringgold Battalion February 9, 1864.